The iced chai latte is everything you love about warm masala chai tea, it's just served as a chilled latte. It is deliciously creamy, perfectly spiced, and the recipe could not be any easier. This recipe is made with an instant masala chai concentrate (or powdered chai tea) so it really is an 'instant' coffee drink. All you need to do is mix the powdered tea with milk and ice, maybe add a little chocolate syrup. That's it, you're done! You can choose to serve the milky tea over ice or blend it into a creamy smoothie. Either way, a smooth, frosty drink will be ready in just a matter of minutes. Stir well or blend in a blender until smooth. Powders can be tricky in the blender and it's best to add the ice, then the powder tea, then the liquid ingredients. This prevents any clumping issues that the blender blades may not be able to reach. 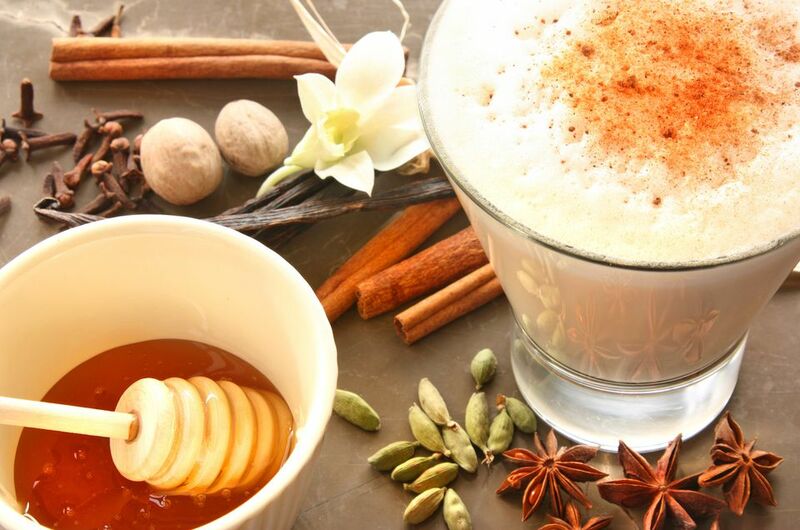 Real, made-from-scratch masala chai tea is always your best option for an authentic chai experience. However, that is not the case in recipes such as this latte. In fact, we want you to buy a concentrated, powdered version of the tea. These are often called 'instant masala chai tea' or 'concentrate masala chai tea.' This form is different from loose-leaf or tea bag masala chai because it is a powdered, just-add-milk version of the tea. It is, essentially, the instant coffee of masala chai. Rishi Tea's Masala Chai Tea Concentrate - Rishi specializes in masala chai, but they focus on loose-leaf and bagged teas. Don't get those confused with the concentrate. There is an easy, homemade alternative to chai concentrates. It is a chai-flavored simple syrup and it is easy to make if you have the spices. There is no tea in this recipe, so it is a caffeine-free syrup that simply has the spices found in masala chai and it is useful in a variety of drinks. If you enjoy chai lattes on a regular basis, this would be an excellent syrup to keep in the refrigerator. It has an incredibly long shelf life of about six months.